Can you check it downloaded in full? MD5: b902d22a9d56f51c4d60491563e49931. And you have the Google-signed Play Store? Not some sort of inverted custom one? Yeah tried all of the links and they all download without a checksum for some reason. What do you mean without a checksum? You don't download checksums, you generate them locally and compare to the one published. I don't know what you are using but it looks like you need to check the box next to md5 and press Calculate. I still haven't gotten the new Play Store with the new category system with this update. I suppose it's regional? Works fine for me, thanks Artem! The first mirror worked perfectly for me. Thanks Artem. Well, maybe it will solve my HUGE problems with Play Store. But I think it won't because I have problems with ALL of Google apps I have. Every single one is sluggish, works totally random, doesn't sync, and Play Store seems to not be able to install apps. Maybe it's Google polish servers fault, but I think this issue needs to be solved. Instantly. Could be. :D Sometimes my phone will randomly decide that texting certain people is bad for it's health and refuse to do it. If you're on a costum ROM, try re-flashing the GApps, maybe it's the cause. Haha. I think if he sold it, he'd only get enough money out of the transaction to buy an actual cupcake. Haha, good. Might want to wait and see what Moto has to offer before springing for the N4, though! My phone updated automatically but I am getting errors all throughout the Play Store like crazy right now! 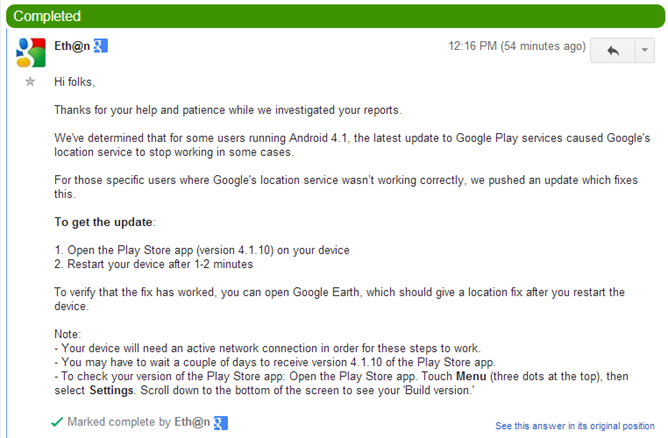 Try restarting, if that doesn't work, uninstall updates for the Play Store, then re-open it. It should update automatically (maybe not to 4.1.10, but up to 4.1.6, then 4.1.10 later this week/early next week). Thanks. I've tried both but it seems to have worked itself out for the time being. I have no idea what caused it to keep throwing errors. Sigh. Oh well, as long as it doesn't start back up then I'll be happy! I thought the location issue was due to the Play Store Services, not the Play Store. I did a quick teardown, and I saw some stuff about nlpCleanup. nlp is related to location services. I think something in there is forcing Play Services to either uninstall/reinstall, or perform some kind of patch on Play Services. Hm... there is a reference to this apk in there: https://ssl.gstatic.com/android/market_images/apks/nlpfixer/nlpfixer-r01.apk . Maybe I'm way off though. play store is not downloading whay? my play store had deleted and not downloading now why? It's not 4.1.1, it's 4.1.10. A zero is very important when it comes to programming and coding language. Can't leave that out. I have no excuse for upvoting this, but I'm doing it anyways. I noticed text on cards is not scrambled/overlapped with prices the way it used to be (Russian language version), now looks better. So, If we dont use the links above, is there another way to download? Wait until it automatically updates. You won't see a notification of it, though. Thanks. New to the Android platform here. Welcome to the family. We've been expecting you. When I read this, it was in a deep, raspy voice. Horror-movie-ish voice. Google Play Services now acts as apk installer too? I've noticed that lately too. I wonder if they've brought the APK scanning over to devices running versions prior to Android 4.2. That's pretty cool if they have. Good catch. I'm still rocking Gingerbread (CM), but it's my first time seeing it when sideloading an apk. It's a good thing if you ask me; better security. As ppero196 replied, they have. I'm still on Gingerbread, so I guess they're rolling it out to pre-ICS devices now. This is really cool then. It underscores what they were trying to get across at Google I/O. They can make enhancements to existing versions of Android without a full on update. Good stuff. I agree. They have a good thing going. The only sad thing is that their current Calendar en Gmail apps do not support pre-ICS devices. I'm still stuck with the old version (and layout) even though I'm installing all the updates. I hope that, once they get backwards compatibility for actionbar (which they are working on now), they update those apps with support for Honeycomb and earlier. I wonder if this is why the battery on my GSM Galaxy Nexus drains so quickly compared to my old CDMA version. From what the phone tells me, Screen and Phone Idle are biggest users of battery on the GSM and Fused Location and Screen were the biggest on the CDMA. I guess I'll give the update a try. [UPDATE] I just looked at the two phones again. Screen still dominates the battery drain. "Google Services" on CDMA is 12% while it's 3% on GSM. One important point is CDMA is aided by a Sprint AIRAVE device, while the GSM is not aided at all at the moment. I still have that location issue in Google Now on my HTC One X. If I install this version of the play store manually, will it still auto update in the future? Or would I have to do it manually from then on? Here I was, hoping it brought a dedicated page for my Paid Apps. Errors! Errors everywhere! I don't know whether to uninstall the update and then try it manually or just wait to see if there's another update that fixes the errors. Downloaded the first mirror, but my phone said that I must enable "unknown sources" to install the apk file. So the apk isn't signed by Google? Rejected. Doesn't matter who it's signed by, any time you try to install an APK directly and not from the "Install" button in the Play Store it's an "unknown source"
okay. thanks for your explanation. how can i see the install button? i dont get it. can you explain it to me? As long as it is an APK, then "Unknown Sources" option should be checked to ensure that the APK installs. Downvoted for jumping the gun without research. Uh. If it wasn't signed with the proper developer keys, then it would warn you about that, but since it is, it won't warn you. 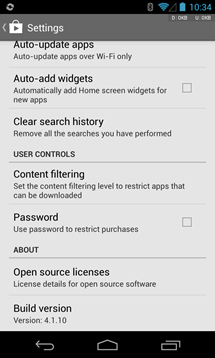 You need to have "unknown sources" checked in any case of sideloading an app. It's the way it's always worked in Android. How can you read android police and not know what to do in this situation? sorry, I missunderstood about the signed apk. I think if Google signed the apk, then there will be no warning.. but thanks to you guys, now I understand and learned from my mistake. package file is invalid not fixed yet. I had v4.1.6 on on HTC One X and it was fine, after updating to 4.1.10 the battery went down - even while chargin from laptop!! I did not do a restart though... I have now uninstalled it and gone back to 4.1.6 & rebooted again and it is now all ok - charging up now! It seems that 4.1.10 is not for everyone after all maybe?? Yeah, the same situation with my Droid 4. It now seems like it's using more battery power faster with version 4.1.10.
i just don't understand, why i cant download some of those applications.the system is keep on telling that sort of google play store app the white bag icon etc. before i can proceed to downloading is anyone could help me please. i'm currently using my dell notebook only for downloading apps for my samsung galaxy s3. 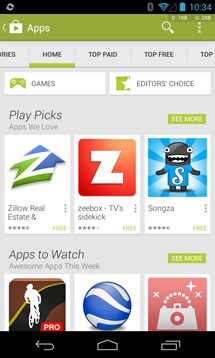 what does "you havent accesed the google play app store(the white shopping bag icon) on your device whit thid emsil? means. anyone there??? 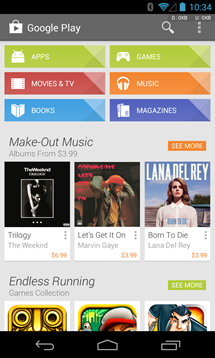 How do you download the google play store to a tablet that does not have it? I have the same question! My Coby Kyros does not have Google Play (just crappy GetJar and so-so SlideMe), but so many cool and useful apps are only on Play. I'm a little late to the conversation, but why don't you install the Amazon Appstore? I need help. I have the Samsung Galaxy Tab 1 10.1 (GT-7510). When I use the playstore I am getting many Device Not Compatible messages. 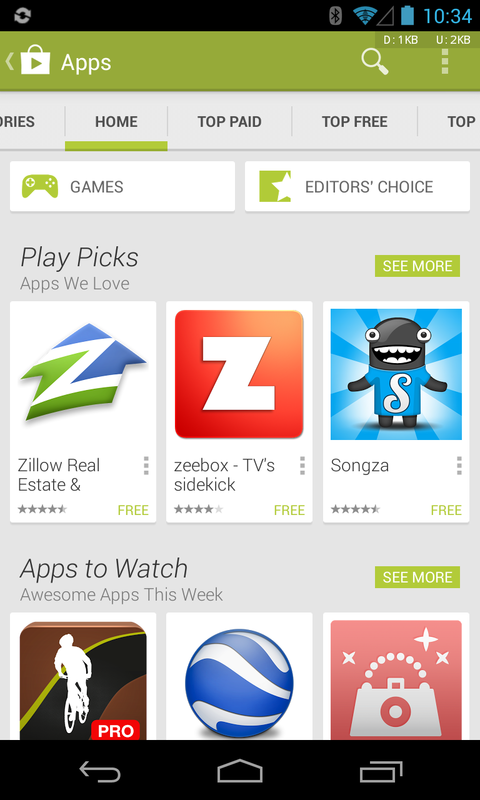 I have the latest version of Playstore. I already uninstalled and reinstalled Playstore but I still get the error. One app with the issue is CreditKarma mobile. Any help would be appreciated. i've successfully downloaded this to my phone but it will not install - starts installing and then says appplication not installed - i've also lost google play services do i need this first? at the moment I can't download any apps as i have no google play store or google play services. please help? When I open play store .it will shortly diappear .? Why it is? How to get google play to work on China phones? How to download Google play on Coby kyros mid7038?? Help me !! I amm like this ap? I have download it n install but still doent open...! How can i update my play store? :( please help me.